Creamy Vegan Cheesecake? YES! Count me in! 🙂 My #1 all-time favorite cake has been reevaluated and improved – for all the beautiful souls craving some real cheesecake goodness. Let’s be honest, raw cheesecakes are fine and delicious on their own but they’re miles away from the experience you get when taking a bite of that creamy baked cheesecake! While my Baked Cheesecake recipe is coming pretty close to that experience, it just can’t compare to this one. 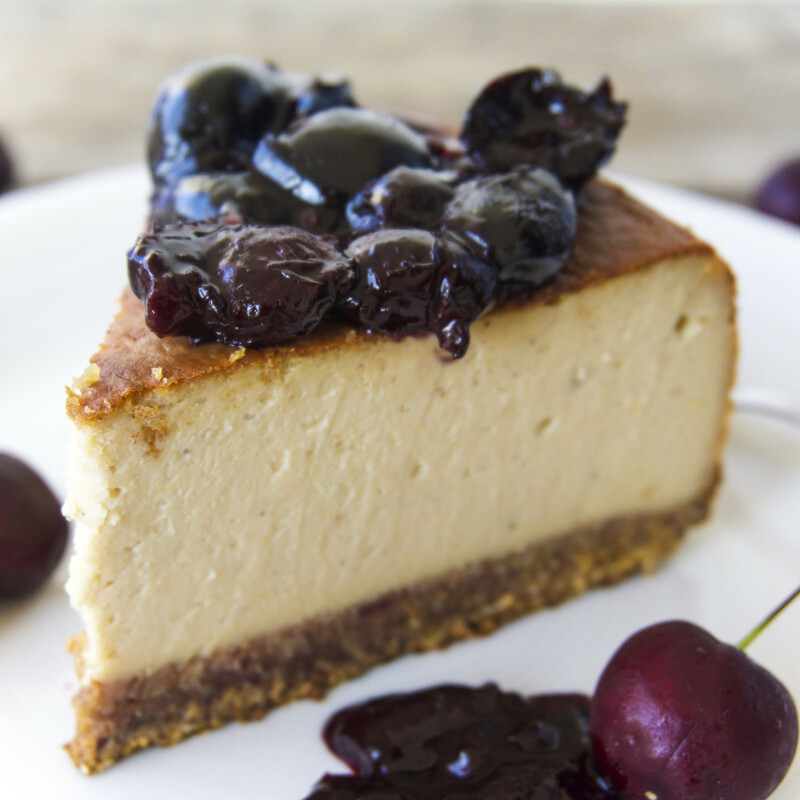 This Creamy Vegan Cheesecake is everything you wish for and more (not exaggerated here)! The secret ingredient for its amazing texture and creaminess is a combination of chickpeas (YES!) and cashews – an idea I got from the wonderful Mel over at A Virtual Vegan. If you don’t know her blog yet, make sure to check it out, like her on Facebook & Instagram and show some love! CHICKPEAS?! – you might think… YES! If you follow me for a while you’ll know that it’s my favorite ingredient to secretly incorporate into healthy desserts. Ranging from cookies, cookie dough, cakes and pancakes, I’ve tried it all! Chickpeas are not only super nutritious but you won’t taste them at all in desserts as the sweet flavor completely takes over! For more chickpea inspiration and in case you haven’t tried them yet, check out my Chocolate Chip Cookie Bites – and prepare to fall in LOVE! 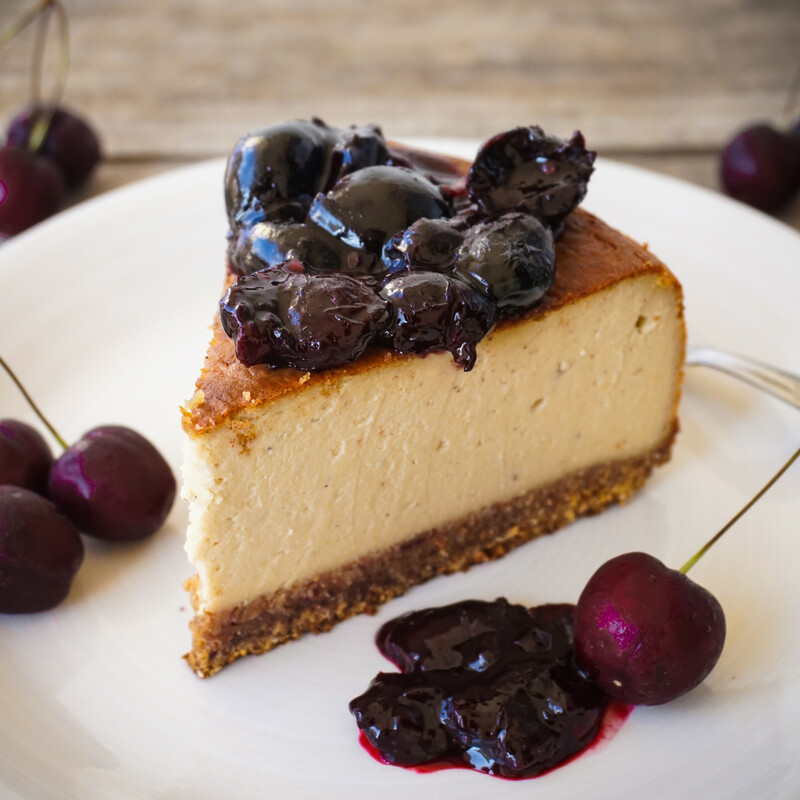 For this creamy vegan cheesecake, I’ve created an incredibly healthy raw crust, replacing the usual expensive Medjool Dates (getting too many complaints there) with dried figs and topped it off with a delicious, naturally-sweetened cherry sauce. Since it is still the last week of cherry season here in Cyprus, it seemed liked the perfect fit! If there is one cake I’d recommend to win over non-vegan folks, or people who don’t believe in healthy plant-based baking (for some weird reason) it would be this one! 100%! For the crust, place the oats and almonds in your high-speed blender or food processor and pulse until you have a fine flour. Add the remaining crust ingredients and blend until you have a sticky dough. Line a round cake tin with parchment paper and press the dough into the bottom of the tin. Use your fingers and eventually a bit of water to evenly press it down and put in the fridge to chill. Prepare the filling by simply adding all ingredients to the blender and mixing on medium speed until smooth (use your tamper tool to mash it down). Once smooth, pour the filling over the crust and place in the oven for 45-50 minutes. If your oven is very strong like mine and browns the surface too fast, make sure to turn the cake once in a while so it browns evenly. Once it's done, take it out, let cool down and store in the fridge overnight (it will firm up). The next day, prepare the cherry sauce. Add all the ingredients into a small sauce pan, bring to a simmer over medium heat and let cook for 5 minutes. Stir once in a while and serve on top of the cake. Yum this was my first time trying vegan cheesecake and when it was baked and cooled it tasted alot like baked ricotta. So delicious. I will try cold as well one day. Oh yay! 🙂 Happy you liked it! It’s amazing how creamy it gets, right?! Should I bake the cake or let it freeze in the freezer ? Which one do you recommend? Just put this one in the oven and realised that I had not greased the Tin…. oops! Hope it comes out ok? Has anyone found vanilla powder in Canada? If you have a Pomme Market around you, they carry vanilla powder. I’ve seen some only at one of the Whole Foods locations around me. You can also make your own, there are recipes online. Didn’t have a food processor so used a hand blender. Didn’t go smooth, but it was still super delicious. Also used strawberries blueberries and raspberries as the topping and it was also delicious. I imagine it tough with a hand blender but great that it still turned out good 🙂 sounds delish! Made this cake yesterday, kept it it in the fridge overnight to eat today, it’s delicious! Super creamy! A very different taste and texture to other vegan cakes I make. Quite big though for 2 of us, so I’ve put slices in the freezer. That depends on your texture preferences 🙂 If you can’t wait you can of course eat it straight from the oven, but if you leave it overnight it will firm up more and become ever creamier! Have to say it sounds and looks amazing! What can I use instead of the coconut milk? This was really fantastic! I didn’t know what to expect from vegan cheesecake, but it was so easy to make and the texture is the real deal. I also added some homemade coconut whipped cream to the top. My diabetic mother ate it and it didn’t spike her blood sugar at all. Thanks for perfecting such a great recipe! Your cookie bites were also delicious! How long does this stay good for in the fridge? How long do you soak the cashews? The directions didn’t say. Can I use arrowroot instead of cornstarch? And can the almond butter be replaced by hazelnut butter? This looks delicious! I will try to make this today…I was just wondering…it is quit hard to find almond butter where I live…can I substitute almond butter with something else instead or just leave it out completely? I’m sorry, Are the almonds and cashews on the recipe required to be “raw”? And for the crust, i can use either of the dried fruits? Or is it a cup of each one of them? What can be used in place if nut? Son has nut allergies. 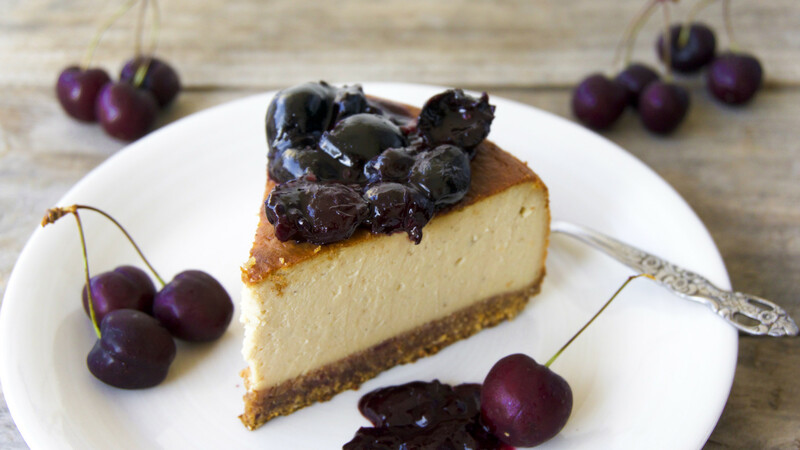 Hello, I must say this cheesecake looks superb!I can not wait to make it but was wondering if you have ever tried swirling in a fruit as in other non-vegan cheesecakes? I wonder if it would change or effect the consistency – perhaps by adding too much moisture? I normally make my family a cheesecake with a homemade strawberry puree that I swirl in , is the only reason I am asking 🙂 . Thanks again for the recipe and info! Wish me luck it looks as beautiful! Thanks so much! 🙂 I’d say that would definitely affect the texture, so I’d probably swap the strawberry puree for less liquid! 🙂 Hope it’ll work! Would you recommend using a water bath when baking the cheesecake? I’m going to make this for my workplace holiday party and can’t wait to try it out! Basically, it’s just a bowl of water that you put in the oven with your cheesecake. The steam is supposed to help your cheesecake from cracking, but I’m not sure if it’s necessary when using these ingredients. I made this with strawberries instead and it is delicious. I was wondering whether I could make a choc or cookie version of this but put it through the filling instead. Would I leave oh the lemon and apple cider vinegar? can i replace cornstarch with tapioca? Can I sub the coconut cream for cashews and how much ? I’ve never actually tried leaving the cashews out so I’m not sure if it will yield the same consistency, but please let me know if you try! It’s my first Vegan cake I ever made and I love it !!! I think I will repeat it again and again. I am not vegan but you convinced me that it can be even better than traditional one. Would the Cherries and syrup on top make the cheesecake “soggy” if left on for 3 days or so? Looks amazing!I’m going to use canned coconut milk, do you recommend using it directly from the refrigerator or at room temperature? Hi, I am planning to make this in a 4 inch round pan. How long should I bake? Any idea? How would I know if the cake is baked enough? Anyways I tried with 4 inch pan, baked 47 min at 320f. Texture is good almost like a real cheesecake, however it lacked the taste of a cheesecake. So maybe I should increase the sweetness , tanginess, and add salt. Hey Vani, sorry for the late reply as I was on vacation! Glad it worked out well with the 4 inch pan and feel free to adjust the sweetness, lemon, apple cider vinegar to your liking 🙂 shouldn’t change the texture too much! Hi! This looks delicious! Quick question…. do I just use the hard part in the canned coconut milk or the whole can including liquid part? Thanks! 🙂 The whole can including the liquid. Just make sure it’s full fat! Thank you so much for this recipe! I was recently diagnosed with alpha-gal meat allergy and can’t eat dairy too! My cheesecake is in the oven as I write and if it tastes like the batter no crumbs, this is a keeper! I’ve never baked vegan before and the cheesecake is for my sons vegan girlfiends birthday cake! I’m going to top with halved strawberries and drizzle with dairy free chocolate sauce….yummm! I was wondering just for curiosity, there is another ingrediente to substitute the coconut milk? My cake never got brown on the top. I left 50 min then kept adding 5 min and checking, with a total of 15 more minutes, as it was still not brown I decided to take it out. Did this ever happen to you? I am making this for my son’s birthday tomorrow. One of my sons is vegan. It looks delicious, I hope it comes out good! Hi there! Thanks for the recipe. Is it a can of cooked chickpeas? How do I substitute with soaked / home cooked ones? HI just wondering should the cake be removed from the oven when it is still joggling in the middle, like with normal cheesecakes etc. or should it be completely set and firm in the middle? Mhhh it should bake until its golden brown on top and set, but it will also firm up slightly more in the fridge overnight! Made this just now. Next time I’ll add way more lemon/lime juice for more zing. Some salt to bring out the flavours too. Personal touches :). Could easily pass for a real cheesecake in look and texture. And the cherry sauce. I added some maple syrup just to sweeten it up a bit. 10/10 for this recipe. Thanks. I tried making this for my mom-in-law’s birthday, and while it tasted great, the consistency was closer to a spongecake 🙁 Do you have any idea what I might have done wrong? Hey Samm! Hm – I’ve never encountered this problem before, rather the opposite that it became too firm. Did you use full-fat coconut cream? That would be my only guess right now..
Can I sub the chickpeas water? Maybe for coconut cream? Question- Can I sub the chickpeas water? Maybe for coconut cream? Ah I see. I read the directions wrong. Thank you. If I did still want to leave it out….. is there an equal substitute for the chickpeas? You guys. This cheesecake is so. freaking. good. And the texture is spot on. I was worried about the coconut flavor being too overpowering but I decided to go ahead and try it since my kids would eat it even if I didn’t like it, but even with the full can (I used Whole Foods brand) it wasn’t super noticeable. The next time I make it I will do the silken tofu substitution and add just a little more lemon juice, vanilla, and maple syrup to see if that masks it completely. But even if it doesn’t this recipe is still a keeper. Wow! Thank you so much for the positive feedback! 🙂 The oreo and graham cracker version sound amaaaazing! Hi! do you think I could substitute the coconut milk for the same amount of vegan yogurt? Forager cashew yogurt is what I have. Or should I try half silken tofu half yogurt? Thanks! I was planning to make this cheesecake for such a long time but was afraid what if it doesn’t turn out good… well…. i should not have waited that long… this cheesecake is AMAZING!!! The taste, the texture, how it looks….everything is just perfect. Thank you so much for the amazing recipe! Hi! Can vinegar be substituted with something? What is its purpose in this recipe? Thank you!